Bring it all back home – in mono. Originally designed by the artist for mono listening, Bob Dylan's Bringing It All Back Home represents the moment that pop and rock music became their own art form, expressions finally treated with the same seriousness and respect as classical and jazz. Incalculably influential, the 1965 landmark established myriad benchmarks in songwriting, sound, artwork, and performance. It served the world notice that Dylan was no longer just the virtuoso visionary tuned into the wants of the folk community. It's a disarming broadcast that declares Dylan's surroundings and personality, and those of his audiences, whether they knew it or not, drastically changed. As part of its Bob Dylan catalog restoration series, Mobile Fidelity is humbled to have the privilege of mastering the iconic album on its world-renowned mastering system and pressing it on 45RPM LPs at RTI in its original mono format. Strictly limited to just 3,000 copies, the end result is the very finest, most transparent analog mono edition of Bringing It All Back Home ever produced. Forever renowned for its organic sound, the album's you-are-there-presence is fantastically enhanced on this superb version, with wider and deeper grooves affording playback of previously buried information. 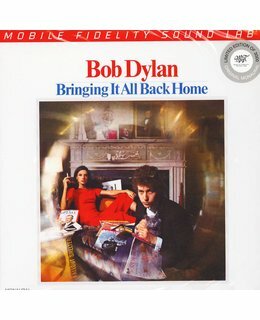 Since Bringing It All Back Home features the most instrumentation Dylan implemented in arrangements at that stage of his career, the set is undoubtedly vivid in stereo – particularly the electric half. Yet the Minnesota native paid particular attention to the mono mix, which here presents Dylan with unparalleled directness. The record's second half sounds especially genuine, lifelike, and intimate in mono. It paints listeners an incredibly accurate portrait of the attention-getting mass of acoustic-based sound – and features no artificial panning or echo chamber of its stereo counterpart. Instead, you are immersed right into the music. Indeed, the sonics on this Mobile Fidelity reissue are so realistic, balanced, and tonally accurate that acoustic guitars resonate with the woody decay they do as when you strum them on your lap. Equally vivid are the textures of the drum skins, amplified pitch of the electric guitars, and ambient hum of the interior space of Columbia's Studio B. Both the plugged-in and acoustic sides claim a discerning level of microdynamics, spaciousness, imaging, and warmth that will send even the most rabid Dylan fans into a tizzy. 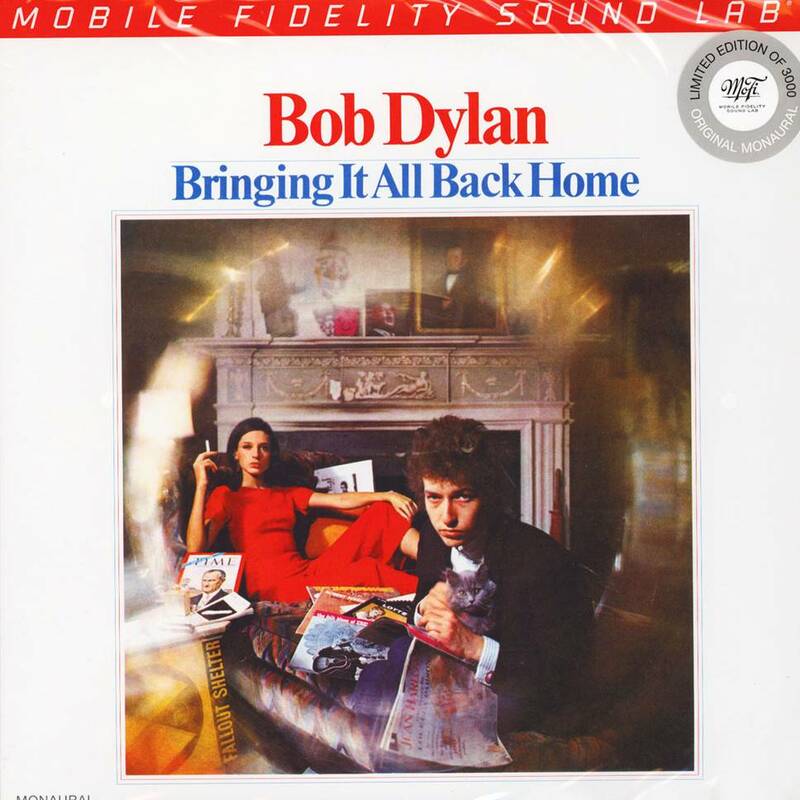 More than 50 years after its release, Bringing It All Back Home continues to come on like a prophetic transmission from a savant who's privy to cerebral viewpoints, mental transferences, and "thought dreams" elusive to everyone but him. With the flipside of the album, Dylan strings together four of the most unflinching, forward-reaching, and boundary-breaking acoustic-based compositions ever played. In addressing liberating psychedelia, lost innocence, institutional naiveté, and tarnished relationships, respectively, Dylan constructs a compositional quartet/suite that functions as metaphor for his waving goodbye to political folk music's imprisoning rules and bounding restrictiveness – and a rough guide to the transcendental poetry, shape-shifting vocal phrasing, and alternate tunings he now embraced. Side One remains one of the boldest cohesive artistic statements ever made. Dylan, forever throwing down the gauntlet to detractors and narrow-minded fans, plugging in with a band and kicking it all off with the in-your-face hootenanny "Subterranean Homesick Blues" before romping, slashing, and rolling through "Maggie's Farm," another fun albeit caustic indictment of homogenous thought and bohemian method. Dylan's attitude undergoes a self-awakening metamorphosis, his lyrical scope broadened, his hallucinogenic interests increased, his willingness to embrace paradoxes and shake them out with mind-convulsing aptitude in line with his progression towards bizarre imagery. Ranked 31 on Rolling Stone's list of the 500 Greatest Albums of All Time, Bringing It All Back Home marks the moment when paradigms permanently shifted, preexisting standards fell, and fresh aural, poetic, and sonic dialects came to fore. Albums don't come more vetted. You deserve to experience the mono edition in the finest-possible quality, just as Dylan intended.